Welcome to the October Rice Extension Newsletter. We're off for the start of a new season! What to do with your rice stubble fallow over summer? Watch the video of how a grower managed to get his drill sown YRM70 short season rice in on time last season. YRM70 planted in the recommended planting window in November yielded higher than crops planted late in December. Watch this video to see how a grower managed to get his dry broadcast short season YRM70 rice in within the planting window last season. Remember planting later in December resulted in reduced yields for this crop. According to growers who drill sow, the dry spring has resulted in hardening of well-prepared seed beds. This has prevented drill seeders, and particularly single disc machines, from working effectively. As a consequence, growers have had to work the ground prior to sowing or have pre-watered to enable sowing to take place. The biggest risk of working the ground before drill sowing is uneven seed placement and seed sink particularly when a tyned seeder is used. It is critical that you monitor the seeding depth (Figure 1) and take into consideration how much soil will spill into the seed furrow when the first flush takes place. Seed will often be deeper than first thought. Sowing at a slower speed (approx. 8km/hr) or pulling a solid bar or tyre roller behind the seeder at sowing can improve seed placement. Sow the seed at a depth of 30 mm below the soil surface (once levelled by hand or heavy bar or tyre roller after sowing). Snail and bloodworm control is often necessary in aerial sown crops. Research in California has demonstrated shallow water (4 cm) had a maximum temperature 6°C greater and a 2°C lower minimum temperature than deep water (18 cm). Rice seedling emergence was 7 days earlier and the plant population was 11% higher. 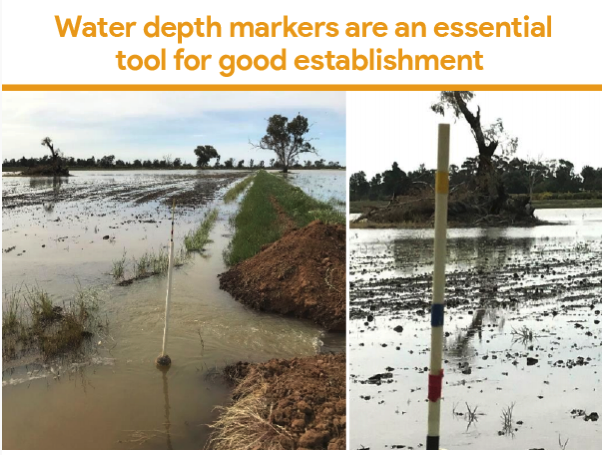 “Do I sell my remaining water, carry it over to the autumn or sow some rice?” and “What do I do if a late allocation is received?” Gross margin analyses of some of these options can be seen here. Planning on planting one of the new short season varieties? There were 98 growers the medium grain YRM70 with 141 paddocks, and 53 growers of the short grain YRK5 with 63 paddocks. We surveyed the majority of these growers and the report is available here. YRK5 is a rotation option to double crop to increase profit per hectare when late water is available. Read about how one farmer last year improved his gross margins by growing a 10.9 t/ha crop of YRK5 after making hay from his winter crop. Last season, a Yenda grower achieved the highest YRM70 yield at 13.3 t/ha with a water use efficiency of 1.4 t/ML and no lodging. The crop water use was measured by the MI irrigation meter and used 9.38 ML/ha. If fallowing, planning for sowing a winter crop in autumn 2018 starts with the actions you take with rice stubble from C2017, read here. Be aware of off-target spray drift damage on sensitive crops when using herbicides in summer fallows. For some identification photos of spray drift damage read here. Population monitoring since 2012 has determined that the Riverina's rice fields support the global stronghold for the species, attracting 500-1000 bitterns in most years. This equates to around 40% of the estimated total population of Australasian Bitterns. For more information about the project to monitor the bittern, read here. Competition closes 11th December, drawn 20th December in time for Christmas! Download the Agtrix Farming App from the App Store or Google Play, or click on the MapRice GIS tab on your computer, login at https://growersweb.sunrice.com.au/. SunRice Grower Services will be emailing you this week with more detailed instructions on how to input your planting details.